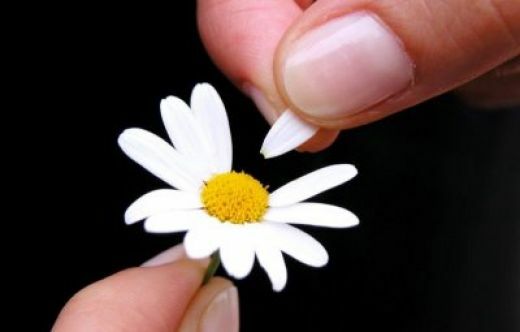 She loves me not…She loves me… She loves me not. “I love you” They’re the greatest 3 words in the world. I love you, SO much. There is nothing sweeter to hear or as sweet to say, I love you. I type these words through watery eyes, tears streaming down my face. I’m learning an important thing about myself. I need someone to love. It is common wisdom today to say that one cannot love another without truly loving themselves. Do you agree? I’m not sure that I do. When I first fell in love I had no love or self-respect for myself. See this post if you missed it. I loathed myself, but seeing myself in the eyes of another helped me to fall in love with myself. But it’s not enough. I’m alone, I’ve hit several “rock bottom’s” over the last year. I begged and pleaded my husband not to leave me, not to leave our family. I offered to compromise myself and my beliefs just to keep it together. I’ve gotten drunk and had a couple “close calls”. A voice in my head told me to have some self-respect, but it hurt too much. I don’t know how to love myself without someone to shower that attention on. Even as I write this there is a voice in my head saying that isn’t really love, it’s selfish, but I’m not so sure. I need to love. It’s not like a drug or alcohol in terms of need, it’s a need as in my need for air. I do love myself, I do respect myself, but I do it through acceptance of people I know and trust, people whom I love and whom love me. I learned to love from their love. It’s the incarnation of God, it’s the movement of the Spirit, it is the nature and essence of love. I need someone to love, and not just anyone. Today I’m in Atlanta, I’m taking another doctoral class. It’s called The Bible and the Ecology of Wonder, cool, right? right… so… yeah. In the middle of class today we were watching a video of astronauts talking about their awe of the moments they were in space looking at the earth and the “heavens.” As you can imagine they were describing deep and profound senses of wonder and awe, even if they didn’t use the words, they were describing an experience of God, the experience of something so vastly beyond themselves, yet felt so rooted and deeply connected to it. I started to get emotional during the video, like… really emotional. I suddenly realized I hadn’t been standing in wonder recently. “Wonder also requires courage” our professor had said in an example of one definition. I kept rolling and rolling around the idea, staring at the astronauts from their suits and shuttles and lunar modules. Wonder also requires a safety, a grounding, I pondered. You have to feel free to wonder, but in order to truly feel free, you have to feel safe enough to allow your mind, your heart, your imagination to soar. If you are paralyzed in fear you are not wondering. You have to move past the fear in order to feel free enough to be in awe, reverence, or curious. You have to have the courage to let yourself go. I’ve cried most of this afternoon knowing that I do not feel that freedom, I am paralyzed in fear. I am afraid to allow my imagination to soar because I no longer have my net, I no longer have my grounding, I no longer feel courageous. Because I no longer have a person to pour my love into that I knew, or at least thought, that I could always count on. That I had exposed myself to on every level. Who knew every dream, every fear, every flaw. Even if he didn’t, he did. I had someone to love, who loved me, or so I thought, to allow me the sacred gift of feeling safe in order to allow myself to soar, in order to allow myself to move beyond fear. Some will tell me I have to find that grounding in myself, but here’s the simple truth. I don’t want to. And I don’t think I’m meant to. I want to share my life, I’m meant to share my life. I can love my kids and they can love me, but I cannot make my kids my life partner. I have a best friend whom I love tremendously and she would help me bury a body if need be, but she cannot be my everything either. Not only would the body we bury have to be her husband’s, but we would end up miserable for a variety of reasons. I miss wondering, being curious, and exploring – my faith, myself, another – it was an ongoing mystery, a courageous adventure, a wonder. I miss being allowed to love and expose my inner most self to someone fully. I feel incomplete, less human, sad without it. It’s not that some magic soul mate is going to come along and “complete me” it’s that in loving them, myself, and loving us love is perfected. For if we love one another, God lives in us and God’s love is perfected in us. This is not just my faith, this is my experience, and my truth. This is who I am. I am a child of God, meant to share my life and my love. This entry was posted in Ministry, Prayer and tagged grounded, love, marriage, partner, wonder. Bookmark the permalink.